Many exciting, interesting and important things happened during Medtrade Spring last week in Las Vegas. That being the case, today I will share some of this, not gossip, but what I saw. The hall was filled with people. The difference from previous Medtrade exhibitions was that everyone attending came to learn and find new OTC opportunities. Another very important part of the show was carrying our message to Congress. The message is we are asking for new legislation (MPP) to be passed ASAP! This is a project for every DME provider to perform. I will repeat in my next blog “how to,” as I saw it done in Florida. We will no longer exist as an industry when part 2 of the Competitive Bid legislation becomes a reality. Many DME providers may be obliged to close their doors as a consequence. This will seriously affect their patients and customers! Too many recipients and their family caregivers will have to run to other locations for their needs. Many will do without. The President and CEO of the American Association for Homecare, Tyler Wilson, will step down in September. He has an exemplary record of accomplishments since he took charge in 2006. His guidance through those trying years has been superb. This year alone, “Stand Up for Homecare” raised more than $50,000.00. This leads me to another thought! NAIMES in the last few years has grown into a most interesting association. Wayne Stanfield, President & CEO, has built a similar association to AAHomecare. Is this the correct time to consider a merger? I believe so! I have always been proud of our industry associations and I know that ONE strong association can be most effective. This becomes paramount since Congress and CMS do not understand the role of DME/HME providers. They only see dollars going out and they do not recognize that they have created a cornucopia, which is being ripped off by others, not by us! If a criminal is arrested for say, selling drugs, he will go to prison. When caught defrauding Medicare, his wrist is slapped and his company closed. This is a big magnet for them. Are there any standards or requirements to become a provider? Eliminating much fraud and abuse would be a huge step forward. We are making some positive moves in that direction. Accreditation is very important, but if someone is dishonest, can they be suspended or their accreditation revoked? It needs teeth! Nurses, pharmacists, physicians, and therapists all require a license, but any one can open a DME location. Our industry has proven by the activities and attendance at Medtrade in La Vegas that they are prepared to have the MPP legislation passed. So please get on board STAT by joining forces with your state and national associations. visiting www.SavePatientAccess.com, Creating an Account, and then clicking "Sign this Petition" to get your name added. Now, the next step is to reach out to all of your personal and professional contacts and request that they too join in the fight to achieve this essential goal, and also add their name to this important online document. First, you'll notice on the page where you sign that there are social sharing buttons at the bottom of the page where you can promote the petition to your connections on Facebook and Twitter. Ask a few family members and close friends if you can speed up their addition to the petition by offering to create their account. Just keep in mind that creating their account will NOT give you the ability to add their name to the petition. After their petition account is created, they will still have to click the link, in the verification email they will receive from Whiteouse.gov, and then they will have to take action on that page. If they agree, go to www.SavePatientAccess.com, click [CREATE AN ACCOUNT] at the bottom of the page. Then add their name, email address, the two verification words and click [CREATE AN ACCOUNT]. Let your contact know that once you create their account, they will receive an email from Whitehouse.gov and they only have to follow 2 steps to be added to our petition. Thank you for agreeing to add your name to the Home Medical Equipment's petition to Save Patient Access. [ √ SIGN THE PETITION ]. If you have a twitter or facebook account please follow the steps to help promote our page. If for some reason you do not see the email come in, check your "spam" or "junk" folders. Please reply to this email when you are done so I can mark you off my list. Thank you for taking the time to Save Patient Access. Try this: Send an email to 10 people in the same social group. For example, your closest family members including their children, but limit it to a total of only 10. If they do not immediately reply that they will add their name, suggest preparing their account as described above. You may have heard me mention that the government has made radical changes to the Home Medical Equipment industry and will soon end my company's ability to provide most products and services at viable rates to patients on Medicare. Medicare is a decent part of my business and though I'll survive it, I am afraid in time other insurances will impose the same changes. The good news is that there is a viable solution that will make reasonable reimbursement cuts to our industry, save the government money without raising taxes, maintain measures to cut waste and fraud and allow established community businesses like mine to continue to participate with Medicare. I am asking for you to help put this plan on President Obama's agenda by immediately visiting www.SavePatientAccess.com. and adding your name to the petition. It honestly takes less than a minute and details of our proposal and simple instructions are in the attached PDF. I would not ask if it was not important, but this is not a contest or opinion poll. If the government's flawed model is repeated in other areas in healthcare, it will affect everyone's ability to get prescriptions, diagnostic tests, home healthcare and even doctor's visits. Please reply when you are done, so I can mark you off my list and it would be great if you could pass it on to your friends. By sending the email out to smaller groups you get their attention, they know you are counting on them individually. Here is a copy of the PDF with details about the proposal and some simple instructions. This was the 36th year that I have attended Medtrade. The show was so different this year. Harbingers of the future were all positive. HME/DME providers are all in the process of changing their marketing approach. Sure we will actively battle the second round of the Competitive Bid legislation. It is critical now that every dealer belong to both state and national associations. They are leading the battle and need the support of every dealer. CMS is planning to further reduce reimbursements by ridiculous amounts. The dealers and associations are working closely. It will take time, but it will happen. So get on board. Every sign that the “recession” is over is another good omen. The stock market has reached new high levels; homes are beginning to sell again. These are very positive signs. The Federal Government is now trying to find the money to pay off the massive DEBT they have. This will be a difficulty that might affect our industry. But no matter what they do, our industry will continue to grow. The industry associations are working very diligently to get Congress and CMS to understand that we are not the culprits and should not be punished. This was on everyone’s tongue at Medtrade. Support has been pledged to get the MPP bill passed. We will show them that when fraud and abuse are eliminated and standards are in place with strict legislation, thieves will be kept out. This will be the best way to resolve some of these problems! Many positive results were accomplished at Medtrade and now we must take advantage of the new opportunities offered for OTC sales found at Medtrade. On the exhibition floor in Mandalay Bay, providers, associations, and buying groups were all working very closely with the exhibitors. Ideas and programs for new Over The Counter cash sales were the key words on everyone/s lips. This show was very well attended, but if you did not make it please plan now for the BIG one in Orlando. TOGETHER we will work with our Congressmen. I look forward to seeing all this accomplished before the Fall Medtrade in Orlando. The day has finally arrived. Thelma and I are so excited about the new venue for Medtrade. Holding the spring meeting in Las Vegas has always been rewarding. We want to be there when Kevin Gaffney and his team cut the rope and watch all of you come storming in. What a show this will be! 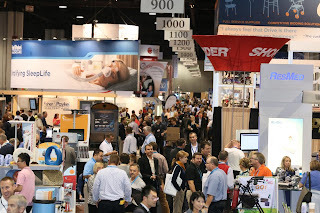 In the past 35 or so years, the Medtrade Exhibitions have offered the attendees many new ideas for their companies. This year we have to work with one another to combat the “sword of Damocles” hanging over our industry. We MUST get Congress to change the current legislation! Health care cannot be provided by the lowest bid submitted or the recipients will end up getting nothing! But one caveat - Please come prepared to work - To be sure that you will be able to stay in business! This is what Medtrade is here for. Get a chance to speak with the appropriate state and national associations. Join if you are not yet a member. Visit all the exhibitor booths; they bring ideas for new OTC cash sales and new opportunities. Find additional ways to increase your profits. Be sure to see all the special displays on the showroom floor, including the alluring New Product Pavilion. When you return home, you will be loaded with new techniques to change your marketing and boost your business. You will have instructions for how to effectively contact legislators. You will see, hear, and learn. After all that, you still will be able to really enjoy Las Vegas. It is a “win-win” program. I LOOK FORWARD TO SEE AND MEET YOU IN LAS VEGAS AT MANDALAY BAY! The response from the state and national associations to get on board to fight the onerous legislation has been the best I have ever seen. I anticipate this year's Medtrade Exhibition in Las Vegas will prove to be the most important ever. I know that Mickey’s voice will bring many new attendees to the exhibition. It is not too late to register and attend Medtrade! The few days you spend at Medtrade will provide you the best ROI possible. There you will be able to assure that your company will grow despite any roadblocks which may appear. I look forward to seeing many old friends and even more new ones at the exhibition! 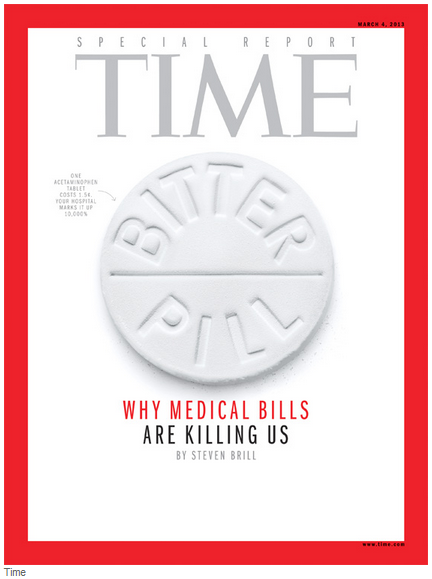 The special report issue of TIME Magazine (March 4, 2013), "Why Medical Bills Are Killing Us," has accomplished much more than I ever anticipated. It made people aware that DME/HME providers are not part of the problem. After rereading this excellent report (about 20 pages), I want to repeat my message. If you don’t have a copy, please get to nearest newsstand and obtain one. I was very discouraged when I saw how many hospitals and chains have blatantly ripped off CMS and Medicare. Where should the blame be placed? Somehow any attempts to slow down fraud and abuse have been fought by the conglomerates who appear to have more than sufficient funds to “buy” support. Our industry does not have that capability. Fraud and abuse must be greatly reduced by CMS and Congress. I spoke to AAHomecare's Walt Gorski, and he estimates that there are about 15,000 “brick and mortar” DME locations. Now, if we can get them all on board, suddenly we become more powerful than any of the conglomerates and lobbyists. Why? Each of the DME/HME operations can work with their staff, associates, customers, patients and family caregivers to deliver our message. It is theirs as well. All of them appreciate the many services they currently receive from their DME/HME dealer. They know much of these are pro-bono. If their provider has to close or reduce services, they will suffer. Let us use this information from TIME Magazine to help build a powerful team, get an MPP program, eliminate the competitive bid and any further reductions in reimbursements. If every DME/HME provider will become an active dues-paying member of their national and state DME association, we will be formidable. So before you are forced to commit Hari-Kari join and invite your clientele to get on board. Are you on board now? We often forget many things, which can affect our business. The Americans with Disabilities Act of 1990 is a tremendous opportunity for DME/HME dealers. Are you aware of what this can mean to your operation? A.D.A. is a door opener! Knowing your Congressman is another door opener! A DME/HME provider from Pennsylvania told me his approach to get both accomplished at the same time. He is very active in the industry organizations. The associations have been asking dealers to contact their Representatives to get new legislation introduced and passed to change the Competitive Bid. That is what he does. He said that when you are active soliciting changes, the congressman will recognize your role. Every provider should follow suit. His idea is so simple. Just contact your HLA in the representative’s office in Washington and his local office manager at home, and request a copy of the Americans with Disabilities Act. You also have to inquire if they are aware of any changes pending to change the “competitive bid” legislation. If they have any questions, refer them back to HR6490 (MPP). Tell them how important this is for all of the senior citizens who live in their district. When you do this you now have opened up a new channel of communication you can use to deliver all of the industry messages (VOX POPULI). Having done this personally when I first went into business many generations ago, I know it works. In this fashion you will develop new friends: the HLA and local office manager. That is their assignment and it develops very good public relations for your company. You asked both for help (the ADA legislation) as well as indicated there is a problem with the bid (MPP). When you told them that you always share with your clientele what the Representative does, that makes you a valuable asset for them. This opens the gate for you to send the legislator some of the information you receive from your state and national organization. By doing this you have established yourself as a voice on behalf of their voting clientele. I will try to share with you other adventures this industry has experienced to consider. Thank you to our associate in Pennsylvania. Please feel free to e-mail (shelly.prial@att.net) me any approach that has been successful for your operation, or give me a call at 321-259-7127 or 321-255-3885. All your fellow entrepreneurs would like to hear ideas that they too can utilize. Every DME/HME provider, pharmacist, as well as CMS and our congressman, should read the special report issue of TIME Magazine dated March 4, 2013. 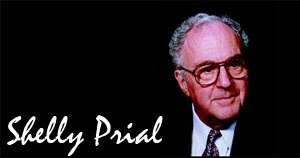 “WHY MEDICAL BILLS ARE KILLING US”, by Steven Brill, is so accurate and important that you have to read it several times. I did! Keep a copy in your showroom and when a question is asked you will find answers! They are in there. After studying this “special report” you will realize that we (DME/HME) are not the culprits that CMS and Medicare seem to accuse us of being. We are not receiving any dollars we have not earned. Our industry is service-oriented and probably does more pro-bono work than any other facet of health care. If every congressman would read this issue, they would recognize how they are being manipulated. CMS and Congress have opened up a cornucopia, a horn of plenty, which hospitals, practitioners and opportunists are cleaning out as quickly as they can. Please involve your customers; their care is at stake! Work very closely with your state and national associations to bring about changes. When you support them (join and pay dues), our industry will get results. At Medtrade in Las Vegas, this is a topic that will be discussed by every attendee. It is imperative that you attend. I hope to see you all in Las Vegas!